DES MOINES (WLNS) - Someone had to win the game but it appeared neither the 2-seed Michigan Wolverines or the 10-seed Florida Gators had the right combination to seal the deal and move on to the Sweet 16. 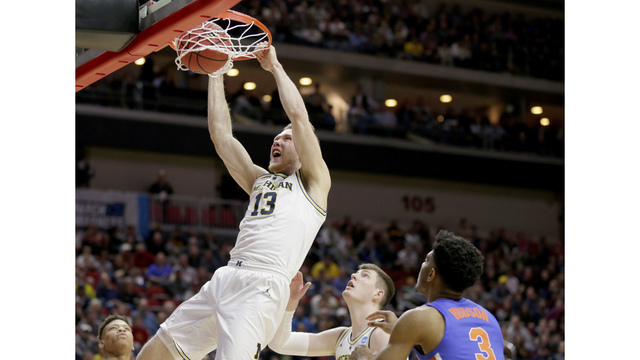 The Wolverines, who had their sights on a third straight Sweet 16 appearance, seemed to be in tenuous control of the game, eventually claiming a workmanlike 64-49 win. This game was ugly on several levels. The teams both shot under 40 percent from the field and could have suffered frostbite from the cold spells they both struggled through. In the second half Florida climbed out of a 15-point deficit but could not grab the lead. At the 4:00 mark Michigan worked their way to a 57-44 lead and seemed to have wrestled momentum from Florida. But in the end the Wolverines played their way in the Sweet 16 next week, lead by Jordan Poole's 19 points. In the first half the Wolverines broke out to an early 9-point lead but weren't able to put the Gators away. At the half Michigan held a four-point lead, 32-28 on the strength of a 3-point shot with 1:00 to play. The Wolverines had three players, Charles Matthews, Zavier Simpson and Jordan Poole, with 7 points each in the first half. Michigan now advances to the Sweet 16 in Anaheim next week. The 6 Sports team will update this story online and on 6 News tonight after NCAA basketball.